MrsChadT: Now You Can Keep Track of Your Mood and Appointments, Too. Now You Can Keep Track of Your Mood and Appointments, Too. Here it is! Fresh off the printer's press. 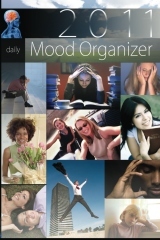 The 2011 Daily Mood Organizer is now available through Amazon.com. Now you can keep track of your mood and your daily appointments all in one. You will notice that this year's edition has been updated with a few new symbols. Due to software revisions and windows updates, some of the old symbols were no longer available through our fonts. I pray that you find none of them offensive. As always the 2011 Daily Mood Organizer runs from December 2010 through January 2012. This isn't your typical daily planner and appointment tracker. This organizer was designed to be an efficient way for mood suffers to summarize information about themselves, their lifestyle, and their habits through the use of charts, lists, and calendars. This information can easily be shared with family members, significant others, and most importantly, doctors to assist in learning to manage one's life through their mood shifts, depression, and other mental health issues. It doesn't get more simpler or compact than this. Just one of the many testimonies we've received over the years. "I recently received the 2010 Mood Organizer as a gift, and I have already found it to be extremely helpful. Small enough to fit in my purse, this organizer makes it easy to keep track of each day's relative levels of irritability, anxiety, and depression. Looking back at daily entries has enabled me to see patterns in behaviors/moods and how they might relate to sleep, nutrition, activities, medication, and other external factors. I definitely recommend the 2010 Mood Organizer to all who are looking for an easy way to monitor and manage any level of anxiety or depression." If you or a loved one suffers from any kind of depression or mood disorders, then this daily planner can help. With the holidays just around the corner, what better gift than to give one that helps sustain happier and healthier lives?